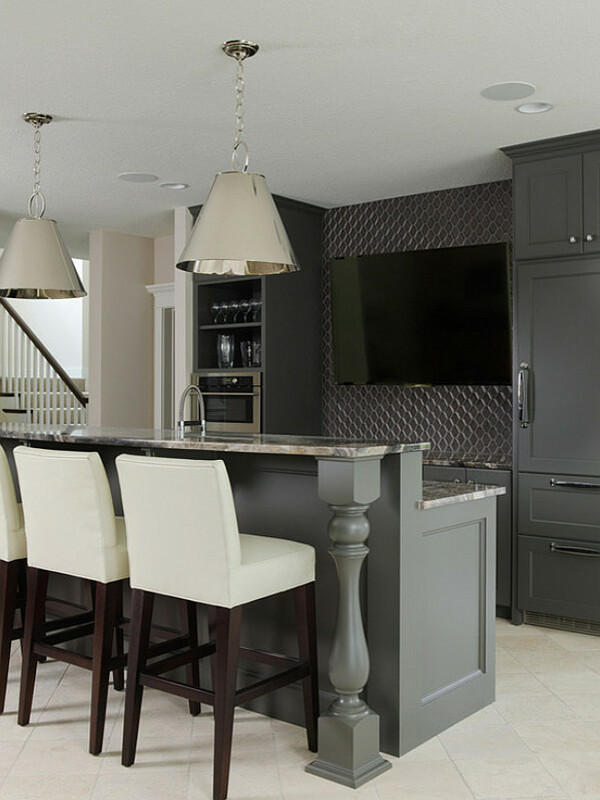 Built by Divine Custom Homes and with interiors by Bria Hammel Interiors , this large family home features many interior ideas that should inspire you, starting with its open floor plan that has an easy flow and an inviting feel. Every room of this family home comes with a unique idea. 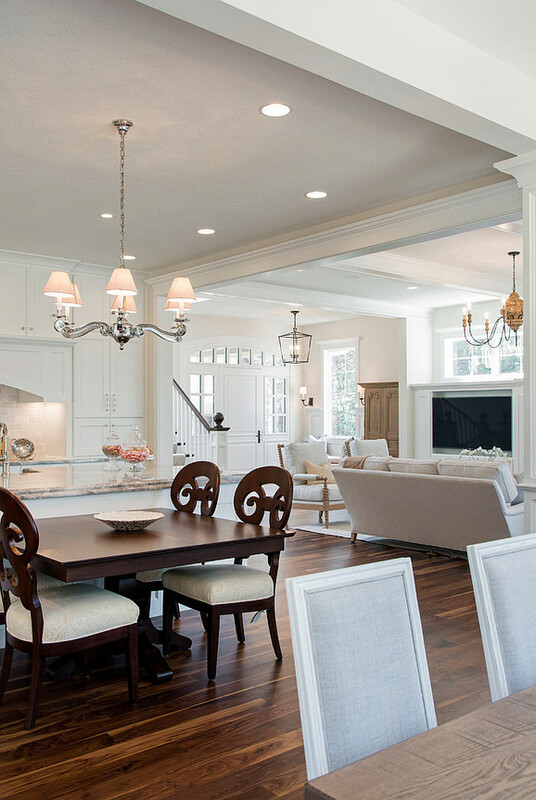 Take for example the kitchen that showcases an island with a connected table, a family room with a built-in cabinet on one side of the fireplace, where the other side features a door that opens to a sunroom. The upper floor boasts a stunning master bedroom with gorgeous decorative details and a master ensuite with his and hers vanities. The basement is yet another place of this home that will surely impress you! It features a large entertaining room with bar, a separate home theater, bathrooms and its own basement mudroom. Make sure to take notes on the paint colors and lighting sources. This home is one you shouldn’t forget! 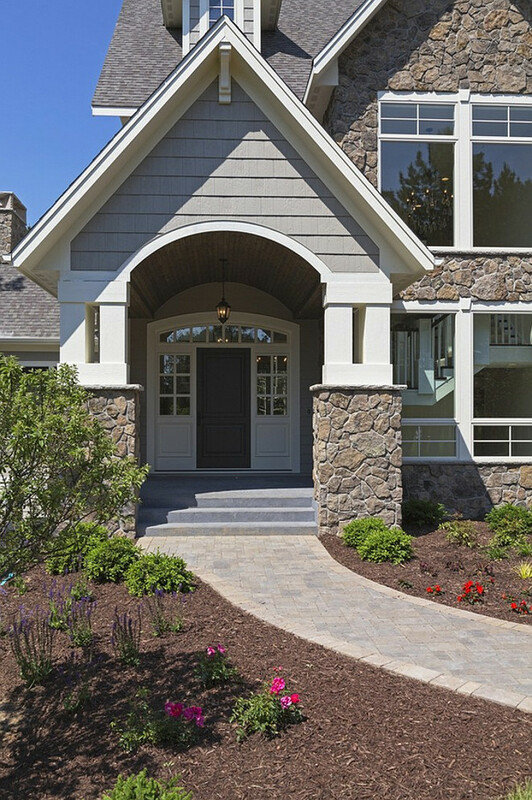 The exterior of this home features gray siding and natural Fieldstone. The charcoal front door paint color is “Benjamin Moore Kendall Charcoal HC-166”. I simply adore this foyer! It’s calming, inviting and timeless. The pale pink and gray rug is by Dash and Albert. This foyer also features a built-in window seat bench with pink cushion and accents pillows. Notice the beautiful door, window trims, and the custom wainscoting. Floors are site finished American Black Walnut. 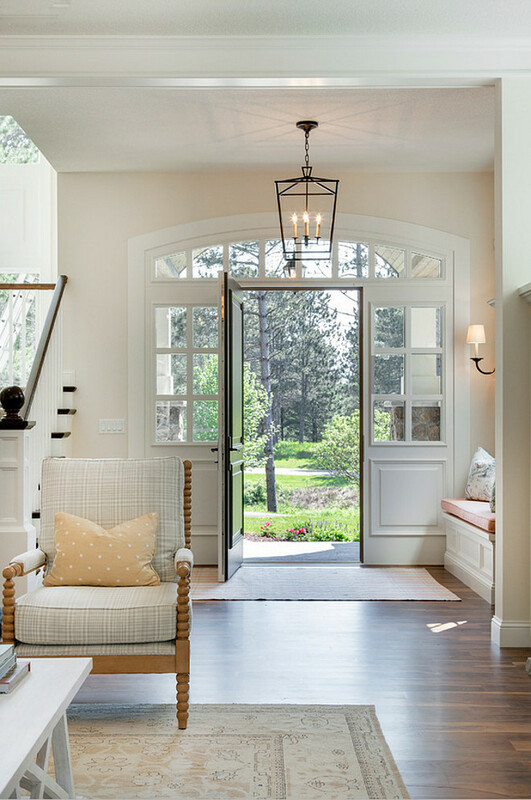 The lighting in the foyer is Darlana Aged Iron Lantern from Circa Lighting. Notice the relaxing landscaping views… isn’t this home beautiful? The main floor paint color is “Benjamin Moore White Down OC-131”. The great room makes me want to hang out in here all day! Isn’t this place comfy and inviting? 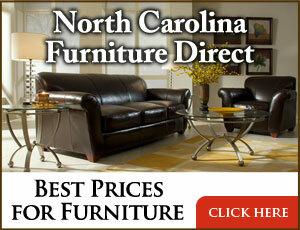 Notice the furniture layout. A sunroom is located just off the family room. 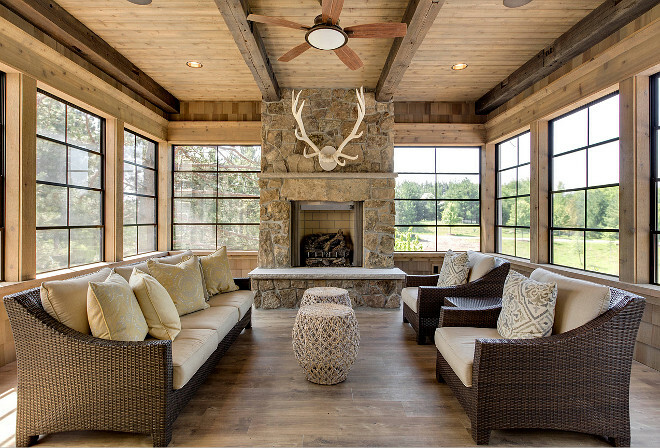 This rustic sunroom features reclaimed wood floors, reclaimed wood beams, black metal window frames and a fieldstone fireplace. Back to the great room, a stone fireplace with thick mantel is sure to be the focus point of the room. According to the designer, the rug in the living room is a one-of-a-kind rug from one of their local rug dealers- it was the inspiration for the whole room. 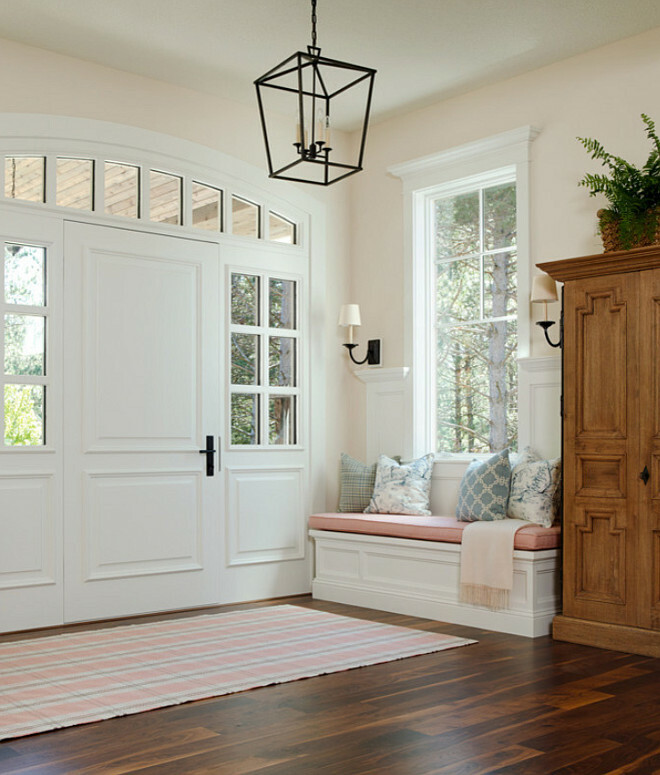 Folding patio doors connect the main rooms to the outdoors. 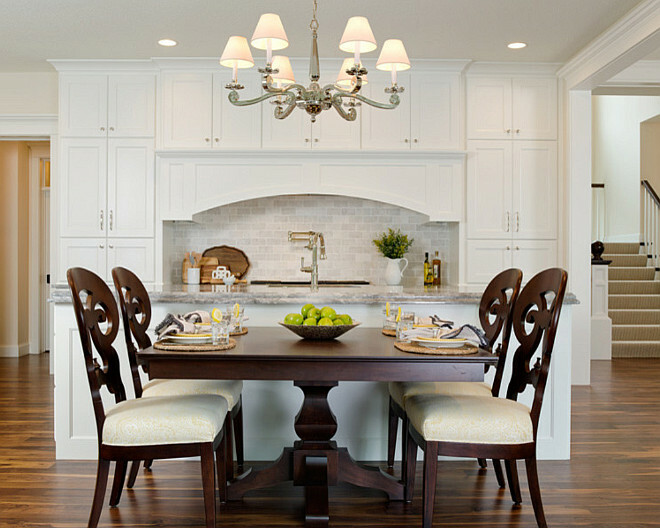 The kitchen paint color is “Benjamin Moore Simply White OC-117”. 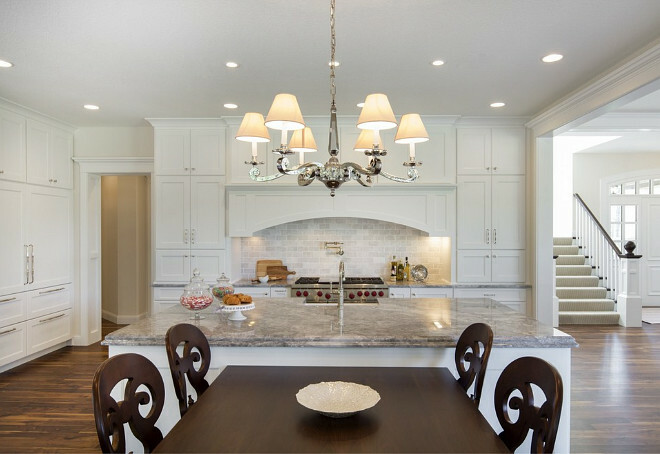 As the picture above show us, lighting doesn’t always need to have the same finish. A dark-stained wood table is connect to the island to bring some contrast and warmth to this white kitchen. 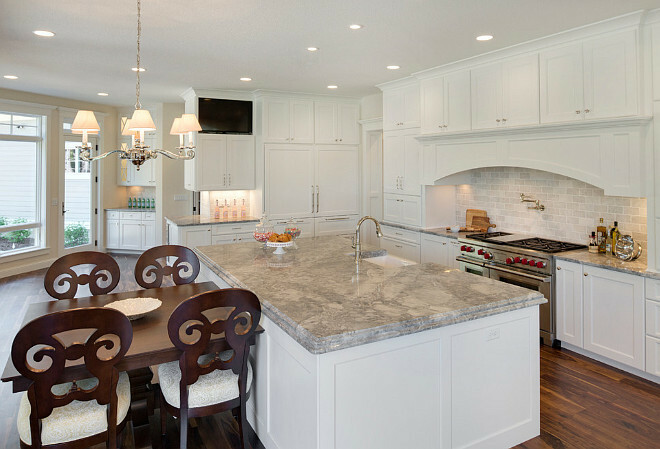 The countertop is “Super White” granite. 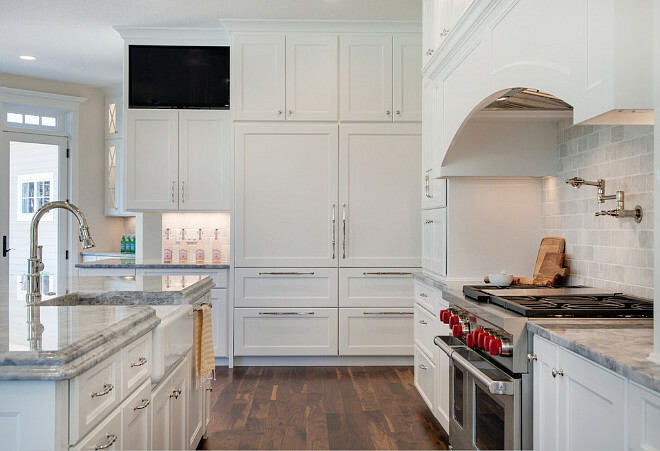 A large cabinet in the kitchen features a TV nook and a paneled fridge and freezer. 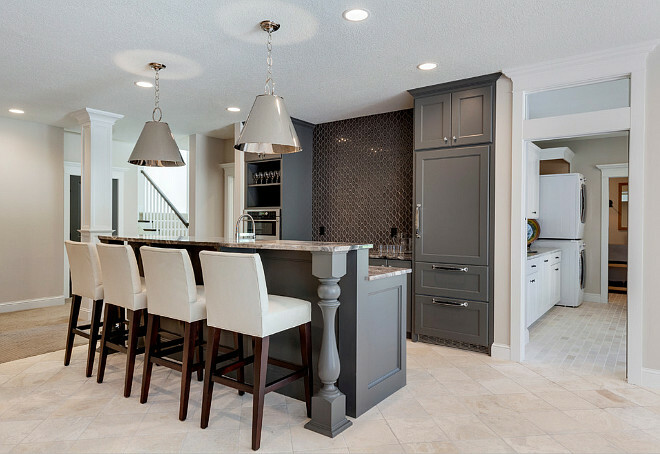 This picture shows fairly well the layout of this kitchen – The kitchen features a bar cabinet on the far left, which opens to a butler’s pantry. To the other side, we see the kitchen opening to a hallway with a powder room. 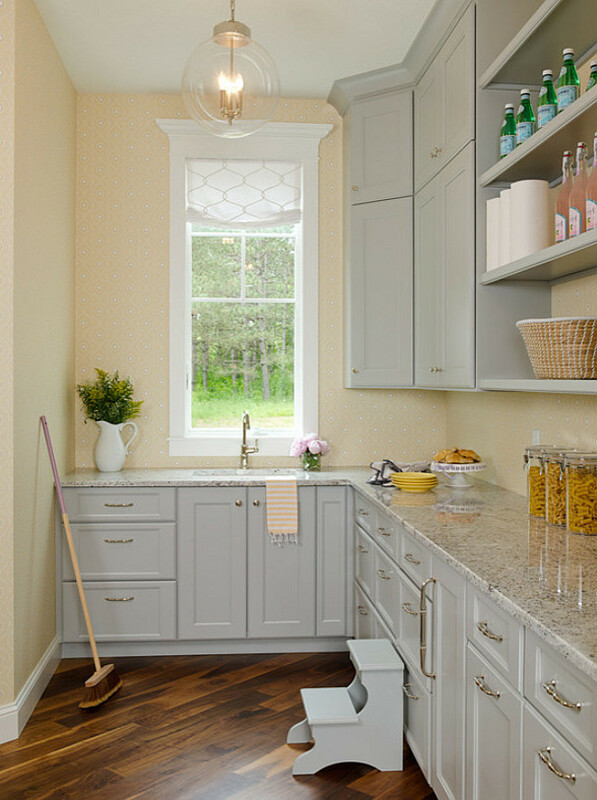 This butler’s pantry features a delicate wallpaper on walls that calmly contrast with pale gray cabinets and gray granite countertop. 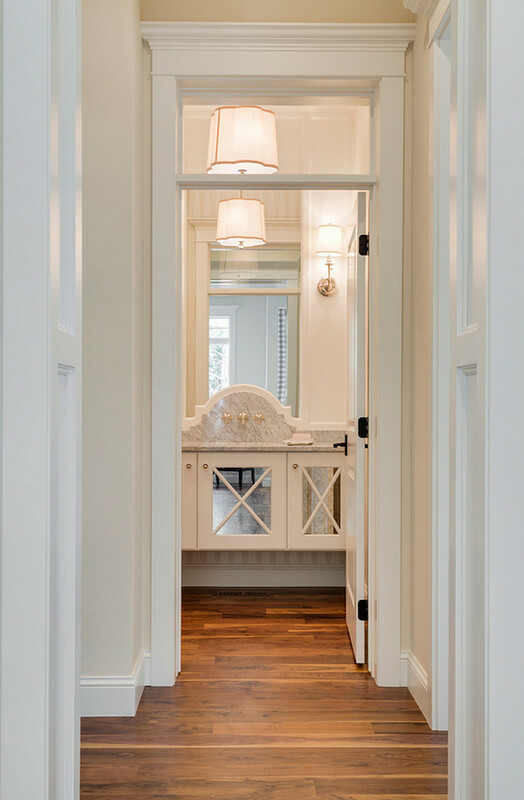 An elegant powder room with hardwood floors is located just off the kitchen for easy access. A gorgeous mirrored vanity with marble countertop and wall mount bathroom faucet are the showstopper features of this powder room. 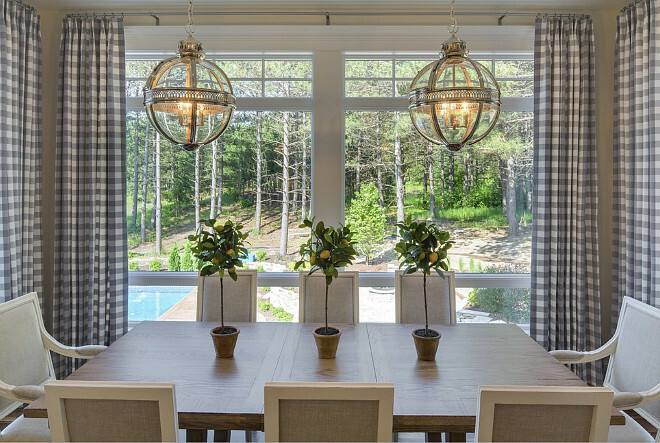 The formal dining room is located just off the kitchen and features gray gingham draperies. I love this modern “home-sweet-home look! Lighting is “Restoration Hardware Victorian Hotel Pendant”. 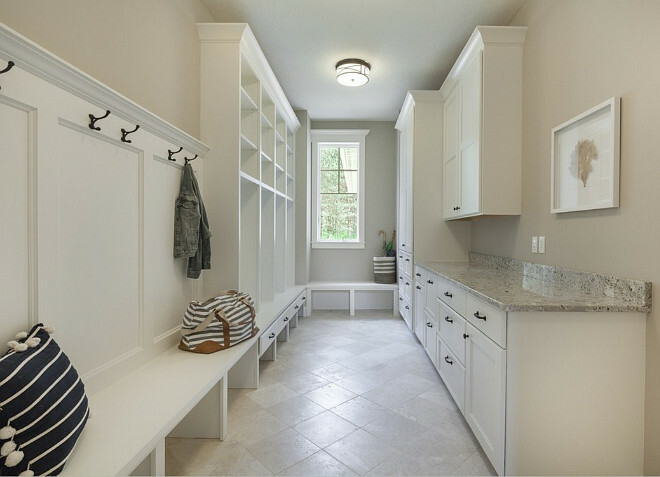 Great mudroom with neutral walls, ceramic tile floors, custom cabinets and lockers. Countertop is “Super White Granite”. 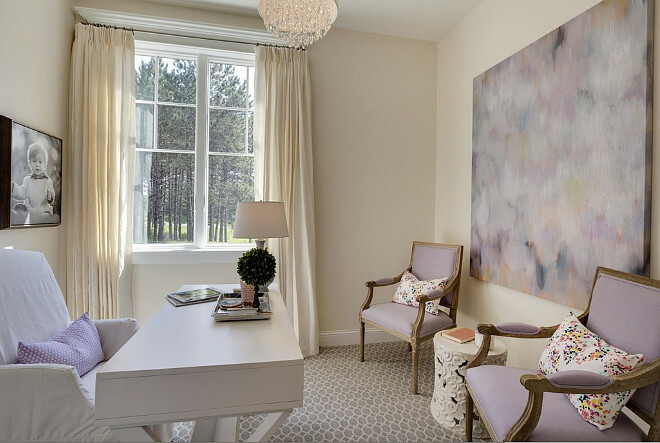 The home office is painted in a calming paint color – “Benjamin Moore White Down OC-131”. I’m also loving the subtle lavender decorative accents in this space. 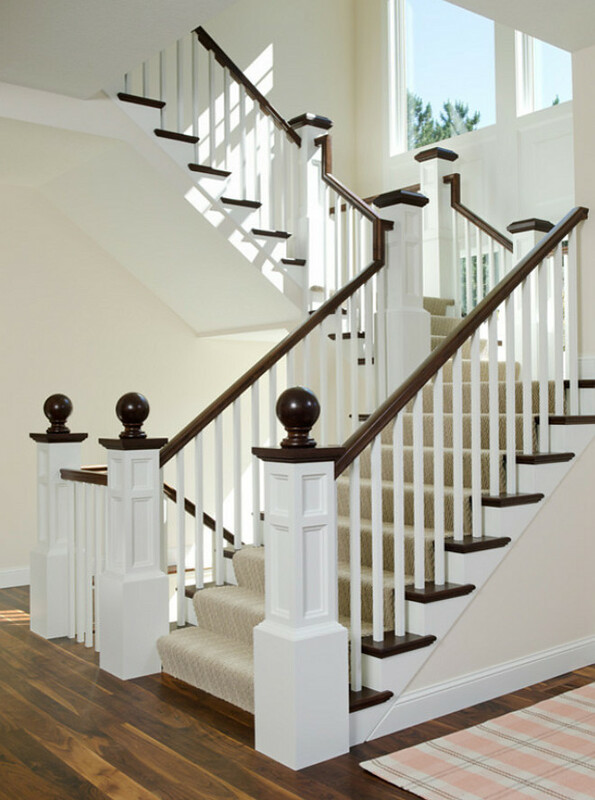 Inspiring staircase with ball finial, white trim, white spindles and custom millwork. This staircase features a classic gray herringbone stair runner. 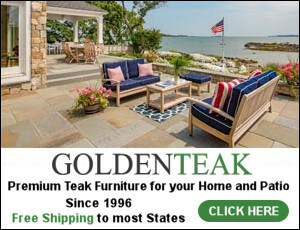 Mirror above bed is Sterling Industries 55-216 Brackenhead In Cambelside Gold – $205 on Amazon. 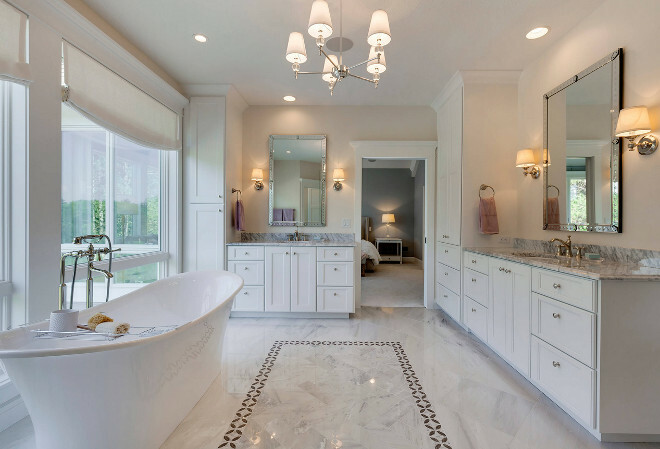 The master bathroom features double vanities, freestanding bath and linen Roman shades. This is an inspiring bathroom tile rug design. Notice the door trim as well. 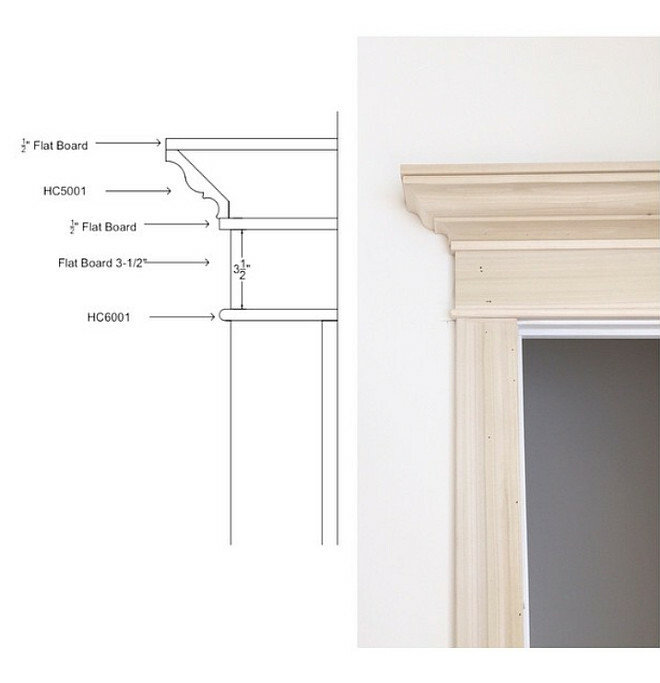 The builders and designer of this home customized every door and window trim of this home and you can see the measurements in the picture above. The basement of this home is fantastic! 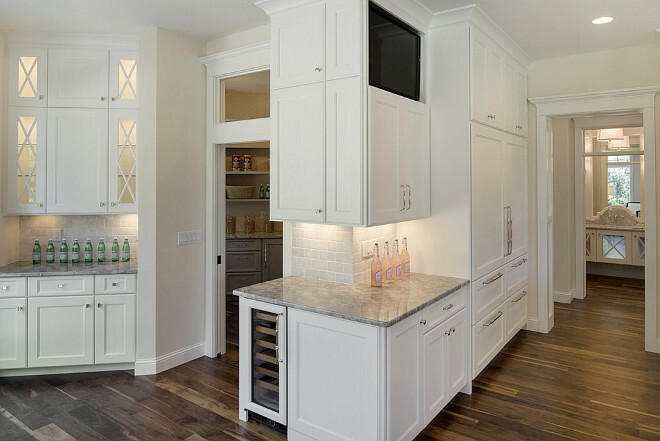 Take a look at this stunning bar and the second laundry room/mudroom ahead. Wall paint color is “BM Edgecomb Gray”. Cabinet paint color is “Benjamin Moore Kendall Charcoal”. 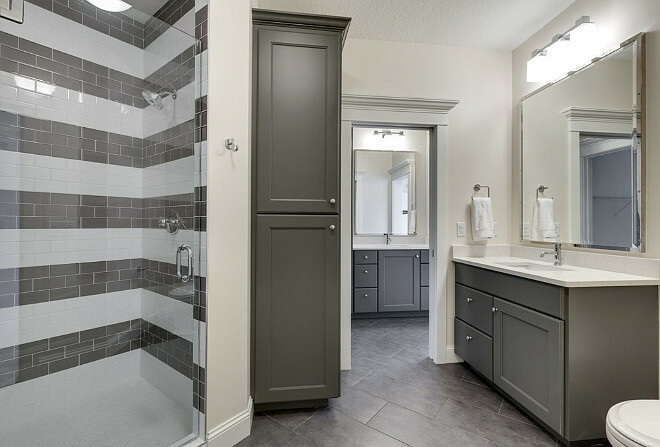 The gray bathroom cabinets are also painted in Benjamin Moore Kendall Charcoal, and here, you can see the combination of the tiles the designer used to bring all the elements together in this space. 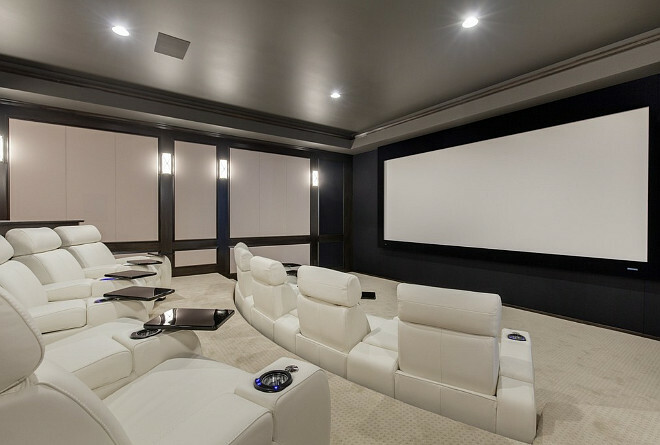 This is how I want to watch movies from now on… What an incredible home theater! The wall panels and chairs were provided by the theater company, Admit One Home Cinema. 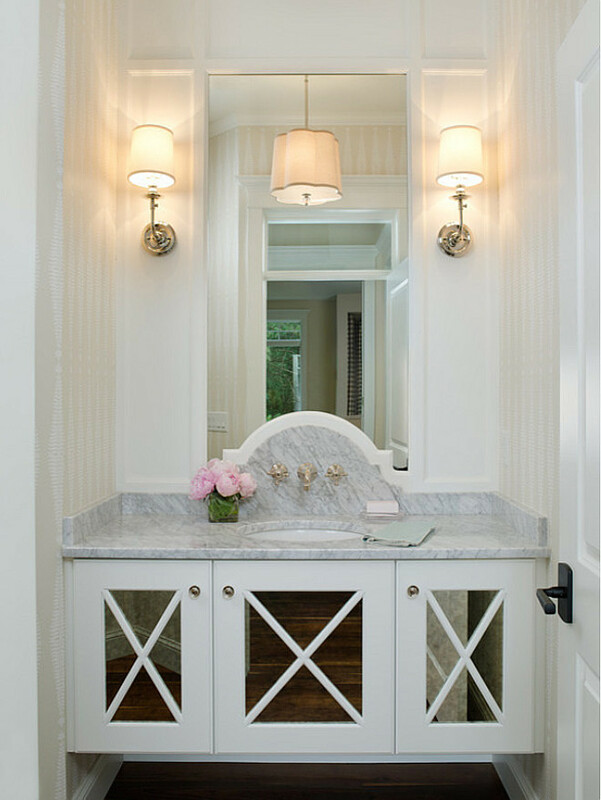 I think it’s always fun to think “outside of the box” when designing a small space like a powder room. 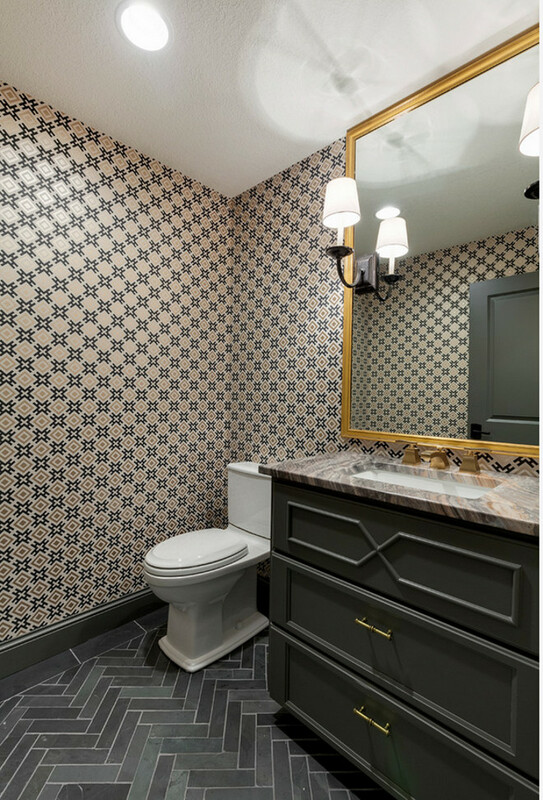 This space has so much personality and I am loving the gray chevron floor tiles and the charcoal vanity. 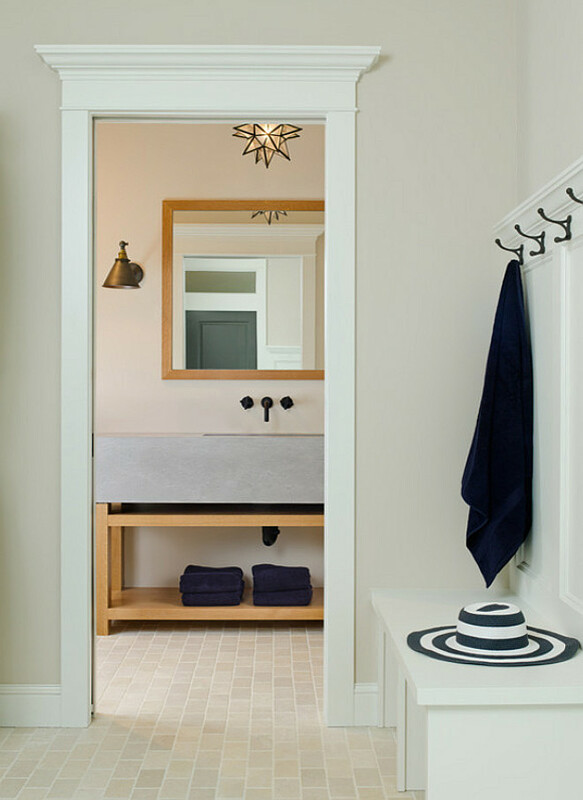 Large family homes are now featuring not only one, but two mudrooms – the first is located in the main floor, and a second one is located in the basement. A basement mudroom can help to keep messy shoes in control and a low-maintenance flooring, like we see in the picture above, is a must. The flooring is called “Blend Crème Tumbled” and it was laid in a brick pattern. The grout is ivory. It was provided by the Tile Shop in Woodbury, MN. The bathroom vanity is a custom concrete vanity created by Living Stone in Lake Elmo, MN. The house was painted in Sherwin Williams “Intellectual Gray” and the trim is Benjamin Moore “Linen White”. Hello and Happy New Week, everyone! How are you today? Did you watch the Super Bowl last night? 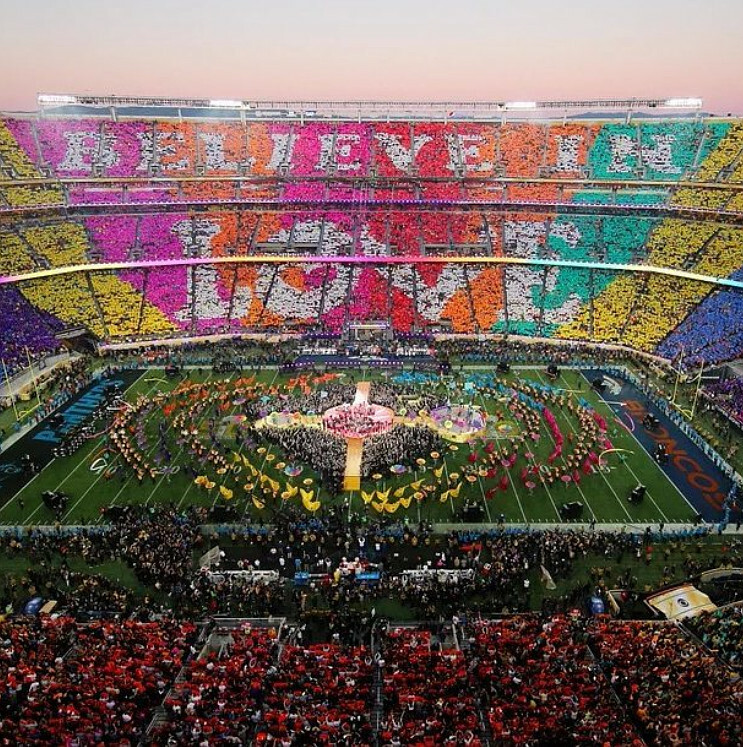 I thought it was really fun, especially the message “Coldplay” left us at the end of the halftime show; “Believe in Love”. Take a minute to think about it today… what would change in your life if you believed more in Love? Would you live more calmly? Would you feel happier? Would you make others around you happier? What would change in your world? Have a Blessed week, my friends and we’ll talk again tomorrow morning! Sources: Builder:Divine Custom Homes. Interiors by Bria Hammel Interiors, Main Photos by Spacecrafting / Architectural Photography. Some Photos by Gridley + Graves. 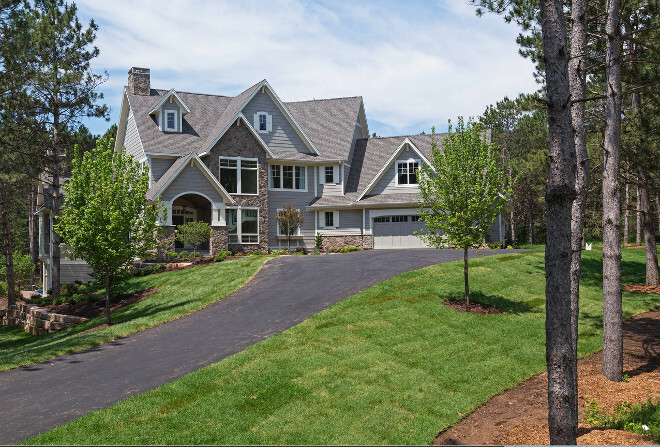 Others who worked on this project: Hedberg Supply Landscape and Masonry, Minnesota Screens, Brock White Construction Materials, Admit One Home Systems. Thank you so much, Pam. I feel the same about this home! This is a rare find!!! This home is lovely! So bright and pretty. 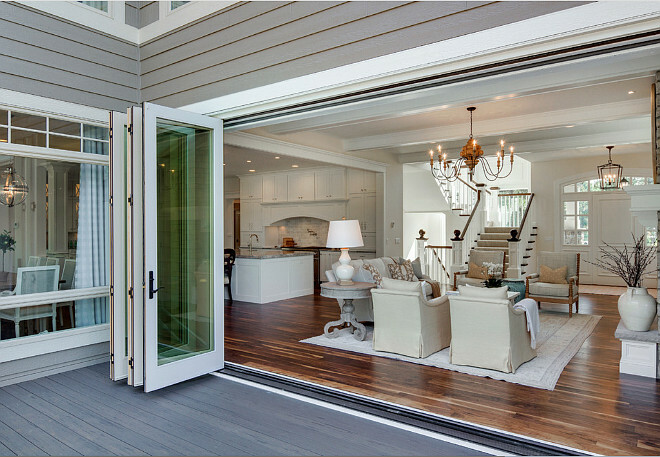 I love the folding doors to the patio. Thank you for including the shot from the superbowl. I loved that. Have a wonderful week! What a beautiful home – so fresh and inviting. Love the kitchen and the outdoor areas…amazing. Wishing I was lounging by the pool! Happy Tuesday! It’s so nice to see you here! I did not get back from the designer. I even sent an email asking this question and I had a reader asking the same question… I will see if she gets back to me and if she does, I will certainly post the answer here. 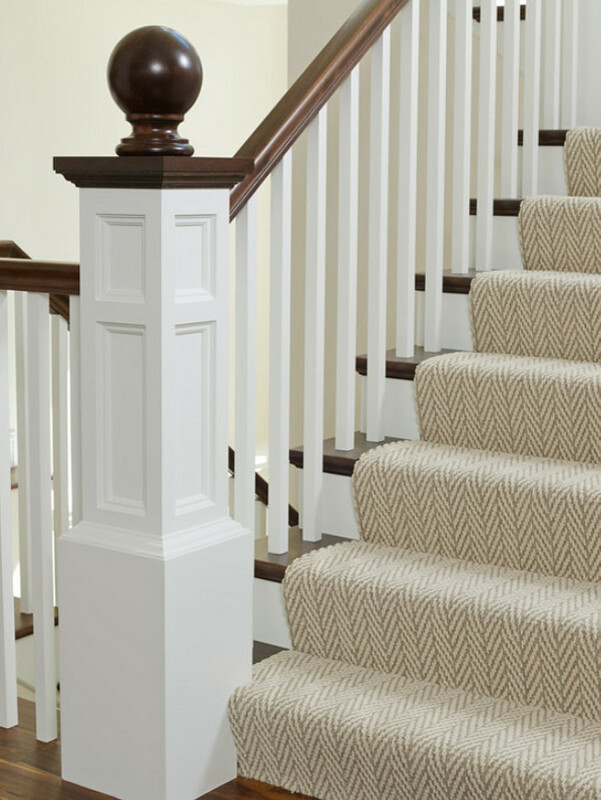 Can you share the brand of the stair runner? Swoon! This home has so many interesting details to copy without being so over the top that one could never accomplish them in a more moderately priced home. I thought the lighting was outstanding! Simple yet elegant. 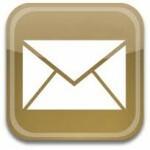 Thank you for providing resource information! It’s the reason I come back to view your posts over and over again. Thank you so much for your comment, presence and sweet words about this post, Sherrie. This is such a beautiful home! I always feel so inspired after visiting your site. Do you happen to know the brand of the stair runner?